Nanowire forests may be the newest technology to enable nanodevices. A single nanowire may be 25 to 50 nanometers in diameter with a length in the hundreds of micrometers – a length-to-diameter ratio that can reach in the millions. The nanowire is made of a platinum-silicide core with a silicon coating to provide a conductive material. This is then encased in an insulating oxide. However, such nano-sized diameters are restricted in the amount of electrical current they can carry. To work around this limitation, engineers have developed a process to grow a large number of nanowires in parallel to create a “forest” of wires. By placing the nanowire forest under the control of a single gate in a typical FET (Field Effect Transistor), a practical nanodevice transistor can be realized. 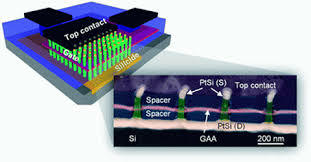 Developers refer to this new nanodevice as a “Gate-All-Around Transistor (GAAT)”. In this configuration the Source and Drain of the traditional Drain-Gate-Source FET are flipped from the horizontal plane to the vertical. The lower end of the cylindrical nanowire makes a Source contact while the upper end makes a Drain contact. The Gate is now surrounding the cross section of the nanowire. Eventually developers will reach an ultimate limit in the size of a transistor which is bounded by quantum mechanics and thermal dynamics. Until then, we’ll continue on the path predicted by Gordon Moore over 40 years ago with continual increases in processor powering and number of transistors on a chip.